You are a pilot of a small space ship on Jupiter's moon Callisto. 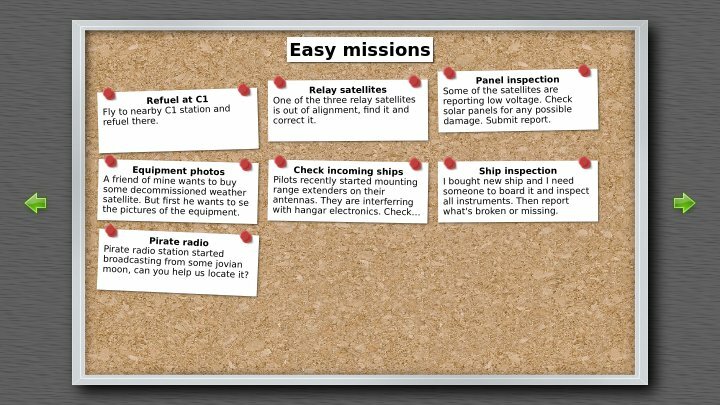 First you will go through few training missions and then you can start completing various missions: Refueling, finding lost equipment, checking for damages, using radio to find pirates, checking ships, docking and many more. All objects behaves according to Newtonian physics and ships use realistic current day rocket technology. Instruments are in sort of 80's space tech style with lot of analog gauges and only bare minimum of computers. This game is quite hard and missions are quite long. There are 24 missions, each lasts from 10 minutes to few hours or more.